When I was six, life was good. I didn’t know anything outside my mother and father’s world. In the village where I lived it was possible to see the mud houses from far away. The Baba Mountains stretched forever into the distance. In spring everything was lush green, the water flowed from the mountains feeding the stream in front of our house, all the time you could hear water flowing. People worked hard on the land every day in the mountains herding sheep and goats or working in the shops at the Bazaar. Women made bread in tandoors. Life in the village of Topi was hard but people were happy. By this point my second daughter Karima had arrived, and then my younger sons Abdul and Arif making six. Life for me was the same, I still went out to collect alfalfa for the cows, washed clothes and looked after my family. My eldest daughter Zarghuna adored her father and never liked to be separated from him. Sometimes he liked to sleep outside under the stars and although she was afraid of the worms in the ground, she would insist on sleeping next to him, lulled to sleep by the sound of the stream running past their home. Rahmony was keen for his daughters to attend school. It was he who enrolled Zarghuna at age six and it was him who often fetched her from school. 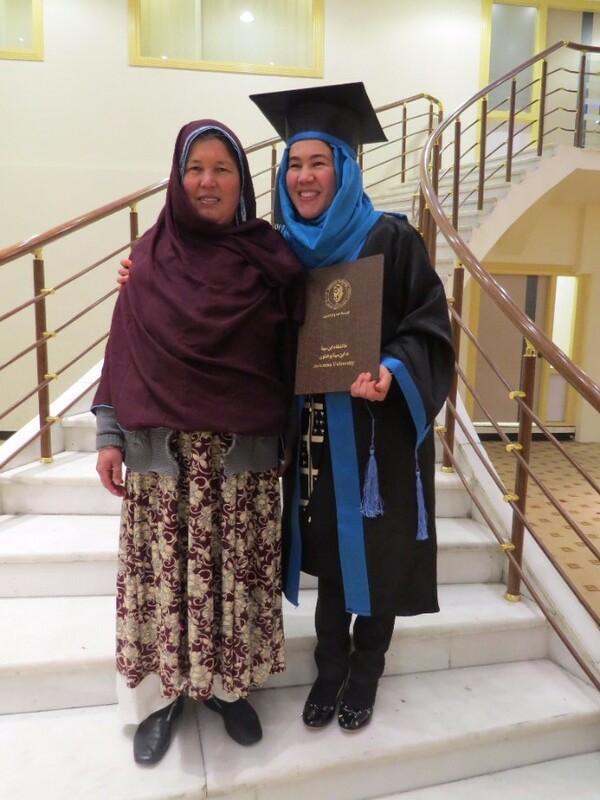 Zarghuna is a member of the Afghan Peace Volunteers, she is the first person in her family to become a college graduate, the first woman in her village and one of the first APVs. She translated her mother’s story and added details from her own recollections. Farzana was extremely proud to see her daughter graduate. 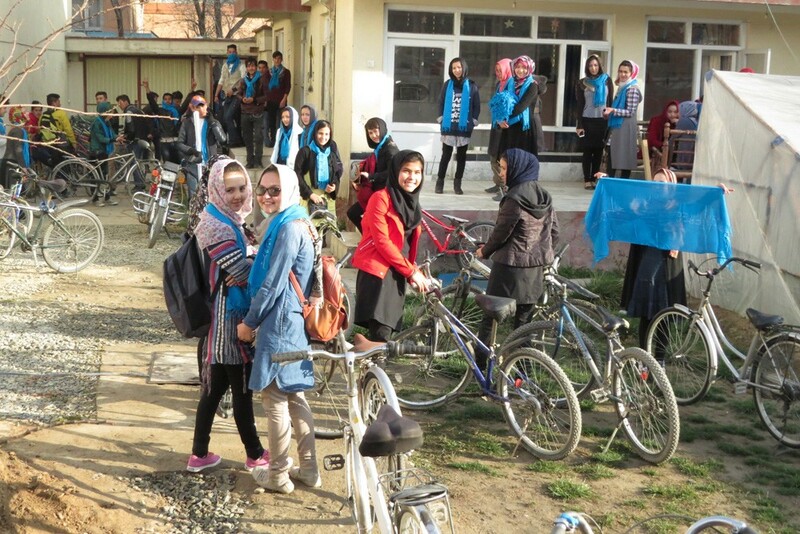 In mark international women’s day, the Afghan Peace Volunteers held a mixed gender bike ride! 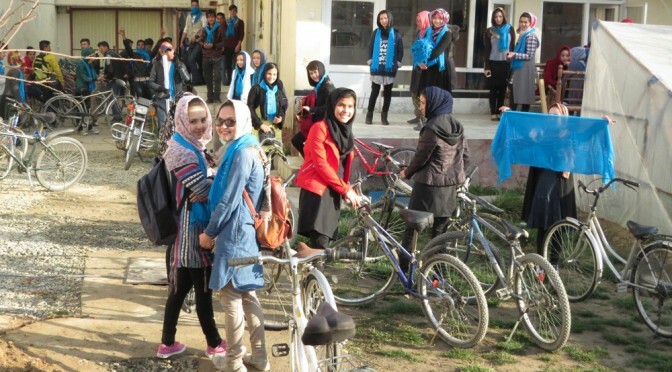 To mark international women’s day, the Afghan Peace Volunteers held a mixed gender bike ride! In the UK, we were invited to join Women for Refugee Women with their campaign to support pregnant women in Yarls Wood Detention Centre – we joined Caroline Lucus, Natasha Walter and others at the Home Office. 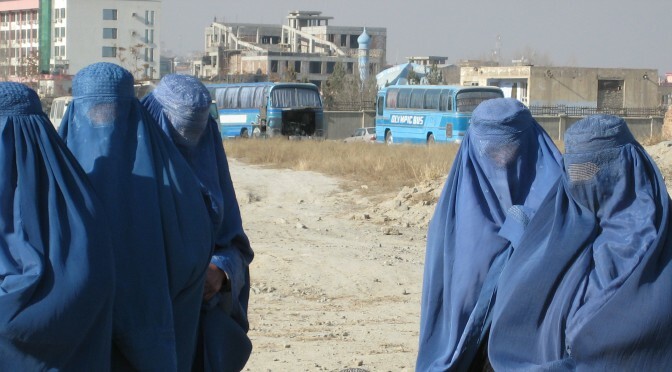 On International Women’s Day, we should question whether conditions for women in Afghanistan have improved after thirteen years of the presence of US/ NATO troops in the country. 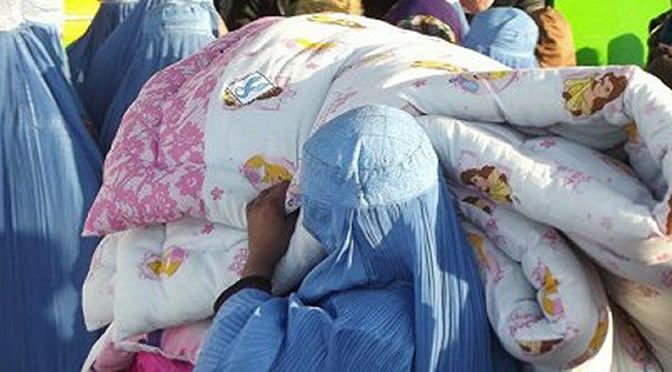 When I travelled to Kabul recently I was able to glimpse first hand how entrenched cultural practices make women’s lives doubly hard, lives that are already made hard by the lack of security. We hear that even people in power support restrictions on women’s ability to move and act freely in public, that they support to the custom that means that women should only travel when accompanied by a male relative. This can be interpreted as not being able to take a plane, cross a border, but for some households this means not going out at all. There are many consequences to not going out, that are dangerous and even life threatening, not just humiliating and unjust. Not going out is not just an issue of inequality but also a barrier to young women’s livelihoods. I spoke to young Afghan women at the Borderfree Centre talk about the barriers put in their way and to Latifa Ahmadi, founder of Organisation for the Promotion of Women’s Capabilities. 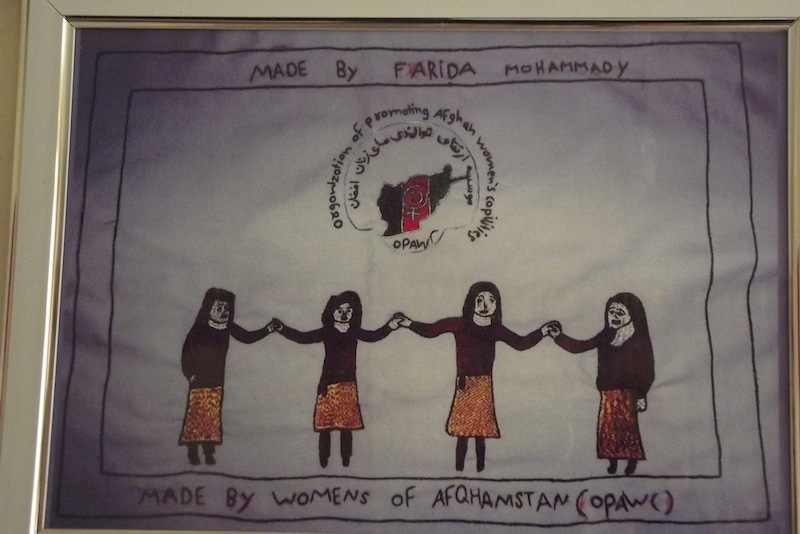 Latifa Amadi says “The way women in Afghanistan are treated badly puts pressure on us all.’ Her demand is that we campaign for Afghan women’s rights from all over the world”. 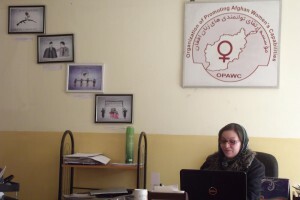 For a short time I was a woman in Kabul. I listened to female members of the Afghan Peace Volunteers and at the APV’s Borderfree centre talk about the restrictions to their movements. The young women I met took on responsibilities in the humanitarian and educational projects run from the Borderfree Centre. One young woman organized duvet handouts at Darulaman refugee camp. 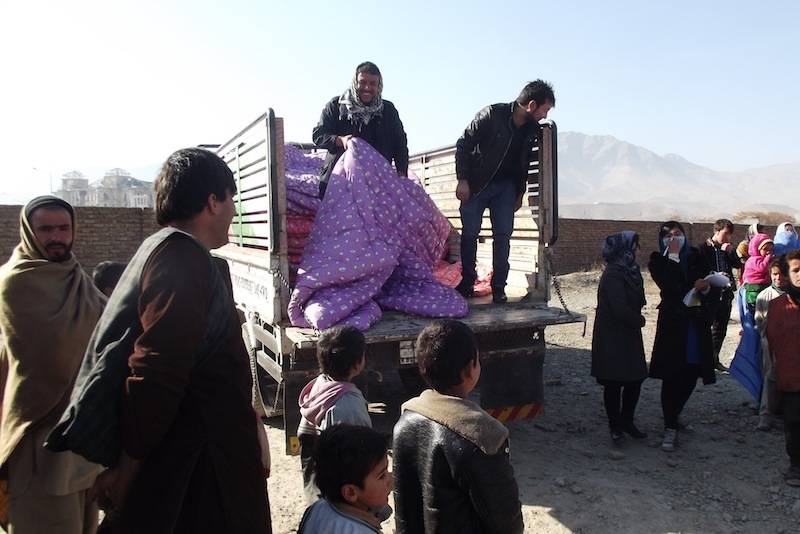 I saw her confidently arrive in the truck, call out names from a clip board as women from a refugee camp came rushing up to collect their duvets. 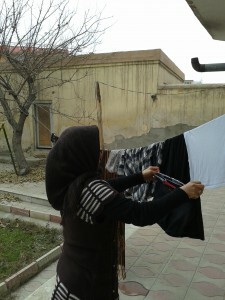 I witnessed another couple of teenage girls organising the local seamstresses who embroider the Borderfree scarves, and checking their work for accuracy. Two young women teach the street children literacy and maths. Another takes charge of the community budget, organising currency exchange and banking the donations. Travel restrictions had other effects on the young women beside making life awkward. While I was in Kabul, I had my own experience of not being able to go out. In my case the reason was because I was a foreigner. The hazards of not going out were realised one day, when by chance all the young people left us four guests alone. I felt like a child again. I wasn’t even sure how to call a cab. I hardly knew where I was. It was only when, to avoid the traffic, the taxi driver took a circular route home I worked out the relationship between the river, the mountains, the main roads and our house. I slowly built a mental map of main roads, the market stalls, a flyover and offices. The girls experienced varying degrees of restrictions. Some were allowed out but had to be back before their father came home. One said she was often hassled in the street, being asked where she was going, what was she doing, does her father know. A relative might see her and tell her father. Another reports not being able to go out if there are men in the house, if their father’s at home. If a woman is not used to going out into society, one girl said, when she does she will not know how to behave and then might put herself in danger. She might behave inappropriately, and be called a prostitute. If girls cannot go out their education suffers. 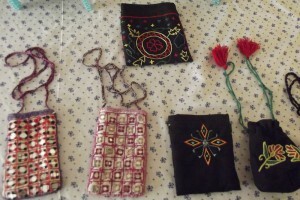 The girls said confidently 50% of girls in Kabul could have an education if they want to. These particular girls were attending classes, university or school in the city. Whizzing around in our delegation taxi, we often saw crowds of teenage girls outside schools, collecting their exam results, carrying their files and books, rushing to lectures. Some girls seem to be getting an education. How good an education was a different matter; our friends complained of out of date text books from Iran, a teacher who kept them waiting in the cold, who talked about himself instead of teaching the class. 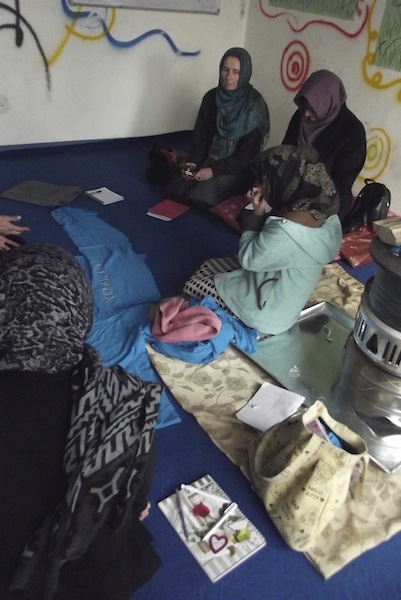 The girls in our community were university students studying for their first year exams. We were told to help as much as possible with the housework and the cooking. They must study hard; they had to do twice as well as the boys to be taken seriously. At the Borderfree Centre, the girls explained that fathers don’t want their daughters to ‘show the whites of their eyes’, an Afghan expression. That is intelligent women become bad women by rolling their eyes, being disrespectful towards their fathers and male relatives. So fathers don’t allow their girls to go to school. Some fathers believe universities are bad for girls, because there are mixed classes and male lecturers. The fathers don’t allow the girls to come to the Borderfree Centre, for the same reason: girls and boys are mixed together. Some girls come to the centre in secret they said. Others have discussed it with their their father and he’s given permission so they don’t care what the other relatives think. More enlightened fathers are happy to discuss things while others insist the female members of the families are home when he gets home. Not being able to go out makes education hard for older women too. 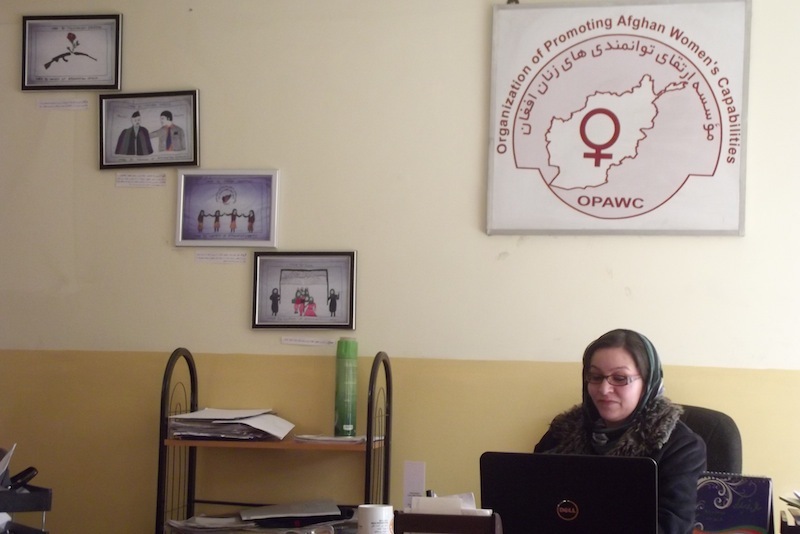 Latifa Ahmadi runs an education project at the OPAWC, offering literacy and numeracy classes. The students progress to learning ‘handicrafts’ such as tailoring, chicken farming and jam making so they can earn a living. We met some of the women upstairs in the freezing classroom, everyone in their coats. They held up their text books. I asked them what made literacy hard, expecting the usual answer, spelling. No spelling wasn’t hard. The thing that was hard, was not being able to leave the house. One said she had to lock her children into the apartment. One woman has to come in a burkha. out, Latifa showed the Mullah the text book. 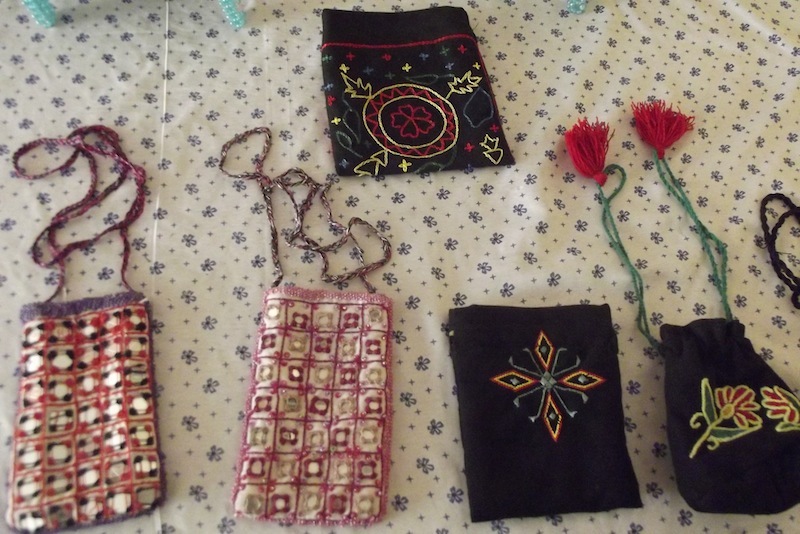 The syllabus is provided by the government, and covers women’s rights, health, domestic violence, and handicraft. All the young women at the Borderfree Centre and Latifa Ahmadi at OPAWC emphasised how important it is for Afghan women to know their rights. If women never go out they will not be able to attend classes. If women are not educated they will not know their rights. Girls and women need to know their rights to a life free from violence, to equal pay, to be able to work, to access healthcare. They talked about putting out a radio programme to help women not allowed out of the house. Women need to be able to demonstrate for their rights, to healthcare, to work, to freedom from domestic violence, even if they join a protest ‘hiding’ in a burkha.